* How do you experience neurotypical reactions to your autism? * How have you dealt with it personally and has it worked? * Do any forms of autism merit a search for cures? 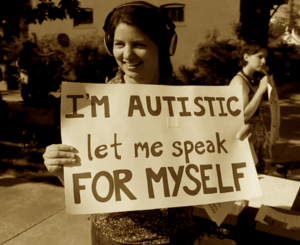 * As a neurotypical parent do you feel heard by autism self-advocates? * Do disabilities like cerebral palsy give appropriate models for how to both accept and in some cases seek to cure a condition? * Have you ever felt discriminated against because of your autism? * Have autistic rights become a full-fledged civil rights issue like those faced by minorities, gays, and the disabled? There won’t be time for all these questions, of course, but the discussion should be lively. Come and join the fun! This entry was posted in News by gregory. Bookmark the permalink.